Two panels from Ruth Cuthand’s Trading series. The beadwork represents diseases and goods that traders brought to the Americas. 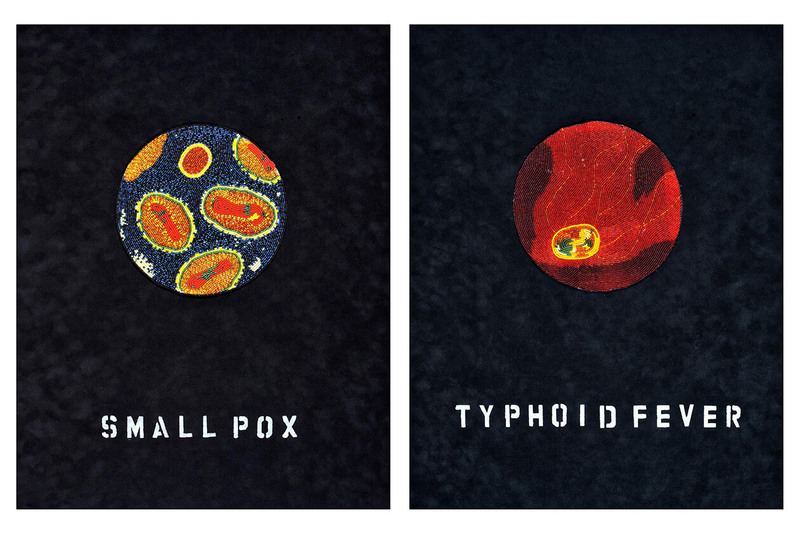 “Smallpox” and “Typhoid Fever” provided by the artist. From the collection of the Mackenzie Art Gallery. Harry and the Hendersons is a 1987 fantasy movie about a Seattle family’s encounter with a friendly bigfoot (Harry) and their efforts to protect him from harm before releasing him in the mountains of the Pacific northwest. It’s a forgettable film, but it has undoubtedly been seen and heard in more Indigenous homes than has the story of Sasq’ets—the original sasquatch. Sasq’ets, whose name was one of the few Halkomelem words to make their way into English, was one of a host of other legendary “wild people” living in the forests on the Pacific coast. For hundreds of generations, Salish and Kwakwaka’wakw children were raised on the stories of the wild people and taught to listen for their characteristic hu-hu-hu calls. Sasq’ets, along with Dzunukwa, were said to capture wayward children, take them away from their families, and eat them. With their supernatural healing powers, the wild ones were thought to be invincible; only once was a wild person taken by angry villagers and burned alive. But to the mortals’ horror, the ashes began buzzing in a tiny chorus of little hu-hu-hu’s, and each particle sought out human flesh. This was the origin myth of mosquitos. Sasq’ets taught our children to stay out of the forests at night. It connected us to our part of the world, in the same way that Hansel and Gretel or Little Red Riding Hood connected Europeans to their ancient forests—and possibly for the same purposes. Our stories are works of genius and beauty, and vital to our relationship with the land. By no means do I want to restrict our legends to Indigenous people. I want you to know about Sasq’ets, and the psychedelically odd stories of the spirit of the South Winds, and all of the legends of our country. Some defenders of cultural appropriation argue that the practice helps spread ideas, and protects and revitalizes endangered cultures by making their cultural output more widely known. In effect, however, this type of appropriation can also kill ideas, strip them of us and feed them back to us—the people who know them best—as acultural pablum. Such was the case when J. W. Burns—non-Native “Indian Agent,” the title given to government appointees who were responsible for controlling the day-to-day lives of First Nations people—first wrote about Sasquatches in 1929 in the pages of Maclean’s magazine. At a time when the Canadian government prohibited First Nations people from most expressions of our cultures, Burns retold the story of “wild people who live in the woods” to a non-Native audience. He eventually grew obsessed with his “Sasquatch,” stealing religious artifacts honouring the Sasq’ets from the communities he supervised, and embellishing the story in decades of retelling; so much so that the story eventually became unrecognizable. If First Nations people had a more influential voice then, they could have corrected Burns’s version of the legend—and possibly prevented the chain of cultural appropriation and whitewashing that ends with Harry and the Hendersons. Such thefts still happen today, of course. The difference is that, in the twenty-first century, we can fight back. Readers of the Walrus are undoubtedly aware of the recent controversy over cultural appropriation in the Canadian media. There are two ways of looking at that controversy, and it is telling that the view which predominates is the one espoused by mostly white members of Canada’s media. This view—represented by writers such as Christie Blatchford, Andrew Coyne, and Ken Whyte—is that Indigenous activists and left-wing dogmatists have banded together and viciously attacked the editor of Write magazine, Hal Niedzviecki, for his editorial asking questions about cultural appropriation. 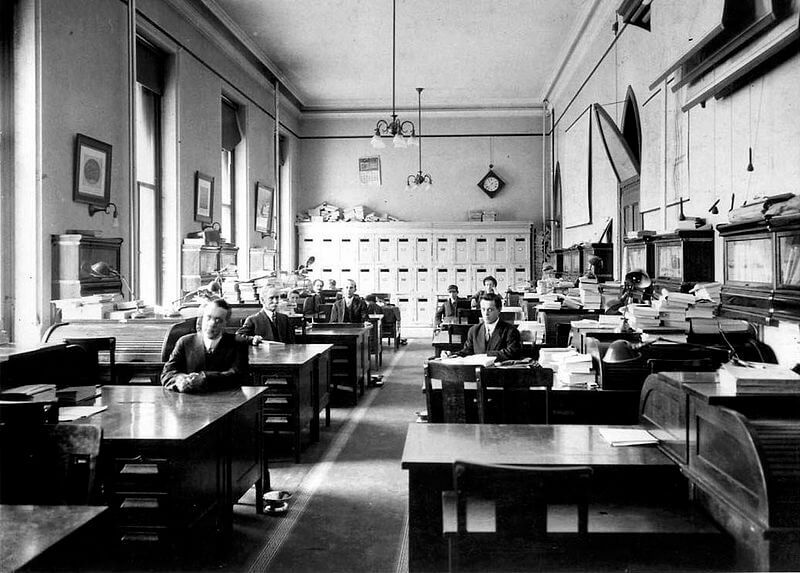 Jonathan Kay, in one of his National Post articles on the controversy, called it a “mobbing.” Niedzviecki’s resignation in the wake of the backlash led a public debate about whether such culture warriors are a threat to free speech. The moment the white-dominated, mainstream press took note of the controversy, the conversation instantly shifted away from the Indigenous understanding of the issue. This shift underlines why an honest and comprehensive debate on appropriation continues to be so hard. The dilemma, very simply, is one of numbers: non-native Canada has twenty-four times the population of Indigenous Canada, and occupies nearly 100 percent of senior positions in media organizations. No matter how small the incursion of mainstream media into Indigenous culture or politics, non-Native Canada overwhelms us. The situation recalls Pierre Trudeau’s famous 1969 quote about the US: “Living next to you is in some ways like sleeping with an elephant … one is affected by every twitch and grunt.” Imagine that but writ even larger, and add to that ongoing colonialism, and all the cruelty and hatred attendant to that, and you may understand some of what Indigenous people fear from the appropriation of our cultures by non-Natives. The phenomenon of cultural appropriation goes beyond the narrow dictionary definition, and is understood by many Indigenous people to include stereotypical and mistaken representations of us and our cultures. These misrepresentations include the hypersexualized view of First Nations women, the myth of the drunken Indian, the football mascot-inspired stereotype of the violent warrior Indian. All of these misrepresentations and misappropriations can have real-world effects for Indigenous people who have to confront the non-Native justice system, child welfare system, or healthcare systems. When faced with a much larger cultural and political force, extraordinary efforts are required to protect your own culture. In 2016, he was by joined Hugh Papik, another Indigenous man who lost his life to a stereotype: he was left to die because his stroke was mistaken by health care staff as drunkeness. Unfortunately, there is no Indigenous version of the CRTC point system, enforcing Indigenous-content rules in our homes, studios, and newsrooms. And so it is left to us individually as artists, activists, and concerned citizens to push the dominant non-Native media to involve us in the telling of our stories. Unable or unwilling to see the hypocrisy of stealing from our culture while theirs is protected, Canadian journalists have been hectoring Indigenous people online, arguing that cultural appropriation is a form of free speech and should be treated as such. But free speech means freedom from government interference, not freedom from criticism. Few people know more about government interference in the exercise of free speech than Indigenous activists who have been tracked, monitored, and interrogated by Canadian security and intelligence agencies. An online backlash to a rude and offensive editorial is not a threat to free speech, it’s an example of free speech. Kay, Blatchford, and Coyne have called for an open debate on the issue of cultural appropriation. I don’t know what form they imagined that debate to take—but this controversy and the online reactions to it by Indigenous people is the debate that they have asked for. Coyne wrote that “Twitter is not the place for these discussions.” Maybe Coyne would like to go back to the chummy and civil debates of the Algonquin round table or whatever blander Toronto version of that exists today. The problem is that there weren’t any Algonquins at the Algonquin round table. Just as there are few if any Mohawks, Haida, or Métis in any major media organization in Canada, save APTN. If Indigenous people are going to have any voice, it will have to be on social media. Cultural mis-appropriators like J. W. Burns got away with their defacement of Indigenous culture because we were prevented from responding at the time. Those days are not coming back. Do the media want to be full participants in debates around issues such as cultural appropriation? Then they need to make the effort to understand how we Indigenous people see the issue, and they need to understand what baggage and biases we are bringing to the table—just as well as we clearly understand theirs. The fact that they have failed so miserably at both those tasks only serves to prove our point that non-Natives, especially those in the media, lack the knowledge and empathy to speak for us.